It takes a strong individual to be a builder or contractor, both physically and mentally. The stress of managing a business, running a job-site, tracking deadlines, scheduling deliveries, not to mention selling jobs, is not a career for the faint of heart. Add a family on top of all that, and even superman himself might need a little help. That is where we, as strong and supportive wives, can make all the difference. There are several things a spouse can do to be supportive and helpful. Be a Rock-Solid Foundation: Self-esteem is critical to most men, and you as a wife can make or break your husband’s confidence. Contractors are like houses in that their most important goal is to provide for and protect their family. If their self-esteem was a building component, it would be the roof – if there are holes and cracks, outside elements can seep through the entire structure. It is up to us as wives to make sure our husbands leave the house each day with the self-esteem and confidence to make good decisions, and handle any problem that might arise on the job. Be Understanding, Don’t React: Many wives struggle with their husband’s job and the pressures it imposes on him and everyone around him. As a contractor, your husband is under a ton of stress. It may seem as though he is pre-occupied or doesn’t care. Show patience and understanding of the pressures that your husband is under, and try to be a nurturing and stabilizing force. When he is on edge about a contract not going through or a delay on the job, you are there to alleviate his nerves and stress, not wind him up. Plan Ahead: The building industry tends to be seasonal, so financial planning is a key to keeping stress low. Create a family budget that covers all twelve months, not just the 3 or 4 months ahead. Remember that construction is seasonal. Making sure that your spending habits don’t rise and fall with the weekly paycheck will save both you and your husband a ton of stress during the slow times. Remember that construction is seasonal. Making sure that spending habits don’t rise and fall with the weekly paycheck will save both you and your husband a ton of stress. Keep A Family Calendar: General Contractors tend to be workaholics. They can get off balance with the family, often forgetting things like your daughter’s piano recital or the Little League baseball game. Create a calendar for the wall so he can see at a glance, upcoming events he needs to attend. Update the calendar weekly, and make sure every Monday you put a sticky note in his truck that lists that week’s events. Family Meals: It is amazing the effect that family meals can have on contractor, and even if he doesn’t realize it, he really craves that family togetherness time. Whether its breakfast in the morning or dinner at night (or preferably both), create a family atmosphere around a table sharing a meal at least once a day. Today’s families are on the go 24/7 and many don’t see the importance of sitting at the same table. Study after study shows that eating together acts as a fantastic glue for the family unit. Meals are often the only time your family will spend bonding without any outside influences. 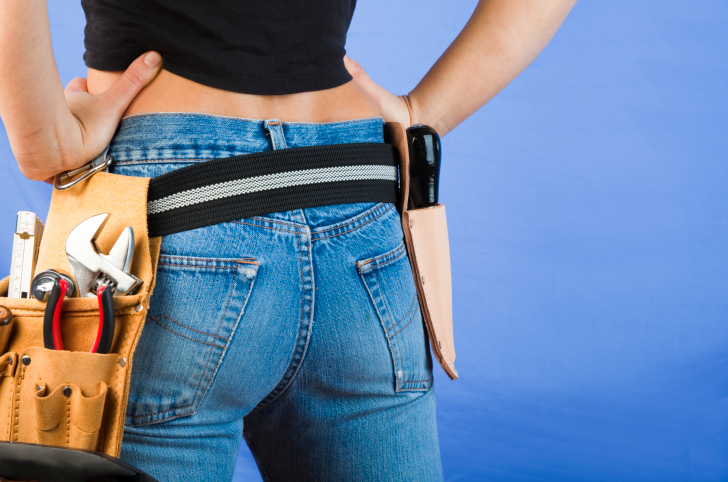 Handle as Much Day To Day as You Can: The number of details involved in a building project is staggering, and managing a job can become an all-consuming task for your husband. It is so important, as the spouse of a contractor, to manage as much of the home responsibilities as possible. Make sure that his time away from the job site is spent enjoying the family, not grocery shopping or paying bills. Keep a Tidy Home: Coming home to a house that is in disarray can be mentally draining to a contractor. A good contractor tries to stay as organized as possible, and a messy house is like going to a building project with the tools and material spread all over the place. Try to keep the surfaces like counter tops, tables and floors clean and clutter free. You will be amazed at how organized your home will look just by clearing off the surfaces. The Creation of an inviting atmosphere will make coming home a delight. Help Keep His Business Organized: There are many things you can do to help with the organization of the business that does not require knowledge of building itself. Builders Need to Feel Respect — Acceptance is extremely important to the type of man that chooses building as a career. Show your pride in his career choice and be supportive of him and the industry. Visit his jobs, take pictures and create of portfolio displaying his work. For information on becoming licensed as a contractor or completing required continuing education to renew a contractor’s license visit www.certifiedtraininginstitute.com or choose an industry from the menu at the top of this page.